Multipex 10: The Animated Short is now FREE to stream! Multiplex 10: The Animated Short is an award-winning comedy about the movie-loving and customer-weary staff of the Multiplex 10 Cinemas. Kurt is an usher, pining for that special someone to share his love of horror movies. 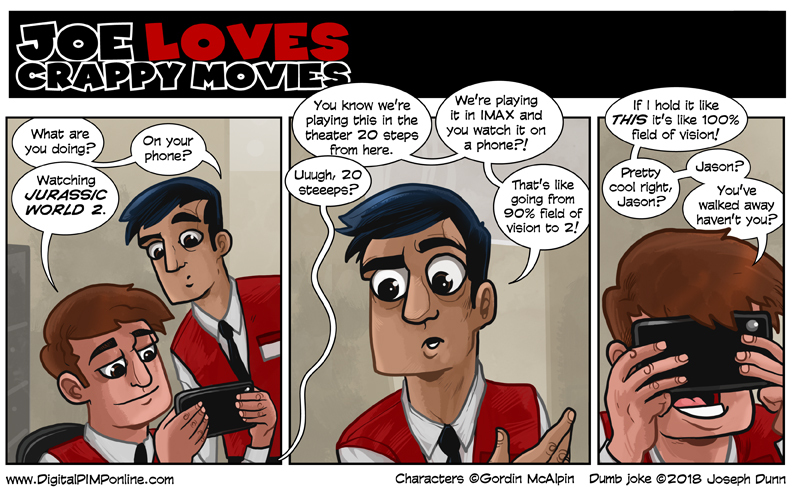 The newest hire, Jason, is a film snob who just needs a freakin’ job. Despite their differences, the pair will make fast friends—unless they kill each other first. Multiplex 10: The Web Series! A Chase Sequence and Strangewaze film, Multiplex 10 was directed, executive produced, and animated by Gordon McAlpin. The short film co-written by McAlpin and Dana Luery Shaw (Echo Chamber, Classic Alice), based on the comic strip Multiplex created by Gordon McAlpin. The cast includes Gordon McAlpin, Tom Brazelton, Dana Luery Shaw, Aiyanna Wade, Javier Prusky (Halt and Catch Fire), Joe Dunn, and Chris Rager (Dragonball Z, Borderlands 2). Tangelene Bolton (American Zealot, Jem and the Holograms) composed an original score.